Last I checked, this character's cosplay outfit was available at Milanoo, Moon Costumes, Costume Family, and Xfancy. Lita is a very independent type. Despite being an orphan (she lost both parents to an airplane crash), Lita plugged on, determined to make her own way, without help. Fortunately, she's a consummate cook who can easily make any meal she needs, and she dreams of becoming a top chef. Her loneliness cuts the other way, too. She's also an aggressive girl who couldn't seem to make any friends at first. She's tall for girls her age with incredible strength under her trim (but definitely womanly) physique and martial arts skills under her belt. She has a reputation for being a "tough chick" who no one, guy or girl, should cross. Her other reputation is for being somewhat fickle with guys. She claims to have a long list of former boyfriends and has yet to apparently have anyone steady. Then she moved to the Juban district and enrolled in school. That was when Serena happened into her life. They actually first met when Lita fought off bullies who were tormenting Serena, but then they met again in school. When Serena learned of Lita's penchant for cooking, they immediately hit it off, despite the fact that Lita had just shown her wild side earlier that morning. The friendship became permanent when Lita discovered herself to be the soldier of nature, Sailor Jupiter. Her powers of nature as Sailor Jupiter tend to focus around thunder and lightning. Lita is still as assertive and as aggressive as ever. If a monster is to be attacked, you can pretty much expect Sailor Jupiter to get in her licks: usually first. She's a girl of action: a stark contrast to the reserved Sailor Mercury. Her directness even shows in her words, as she usually gets to the point. 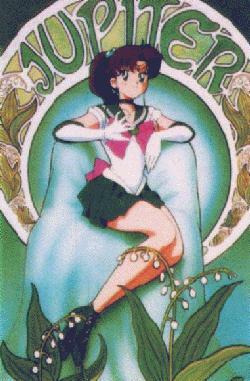 Her Japanese name "Makoto Kino" translates to "Wisdom of the Forest", and when you think about it, it makes sense. She has a practical wisdom about her that has kept her going. The planet Jupiter is associated with the forests because of its Japanese name "Mokusei," meaning "forest planet", and forests are frequently associated with nature and natural phenomena (ie. lightning).